With the success of How to Customize Crochet Chair Socks, I wanted to make something similar to the article but about a different subject matter. 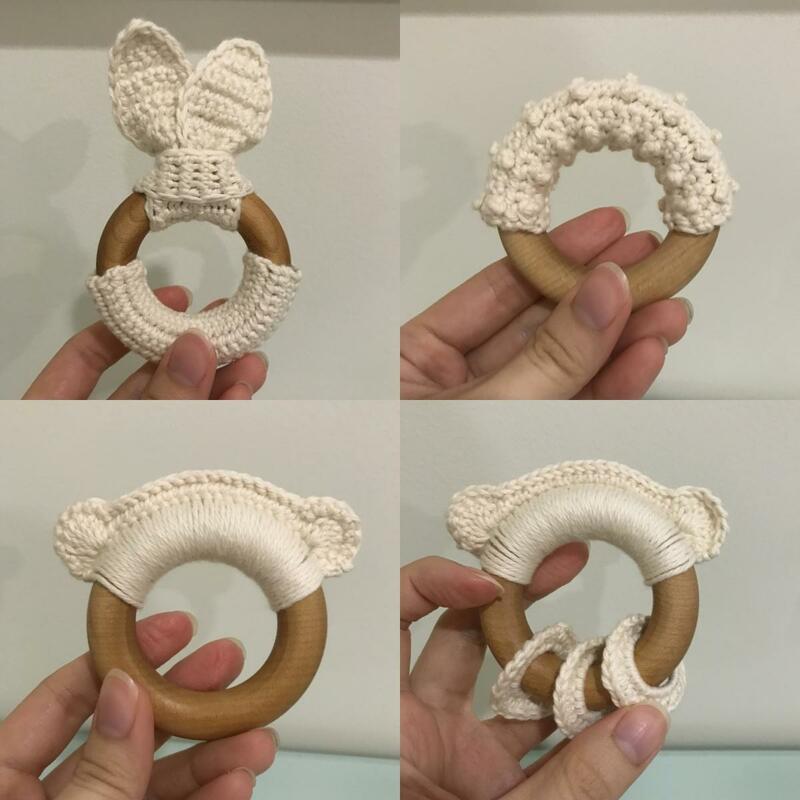 I was making some of these crocheted teething rings for my upcoming niece and found very few tutorials on how to customize the rings. 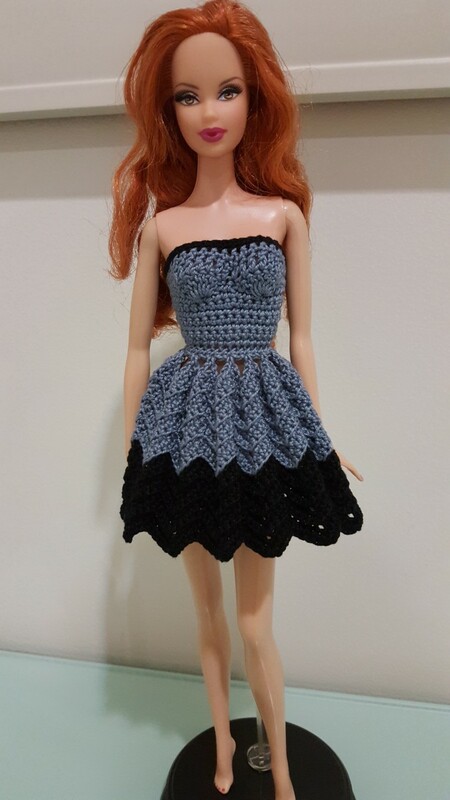 I found a lot of interesting designs on Pinterest, but they were usually just products for sale, not tutorials on how to make them. 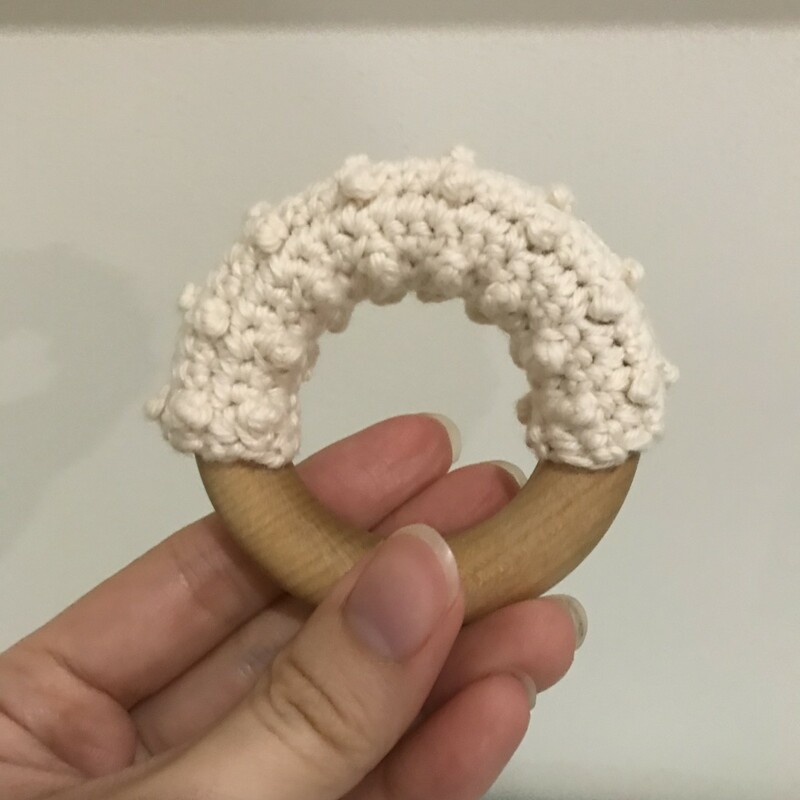 So I thought I would come up with my own way to customize wooden teething rings by crocheting organic cotton yarn elements for them. What Is Teething and When Does It Typically Start? Why Choose Wooden Teething Rings? Babies are teething when their first set of baby teeth come out through the gums. While teething usually begins at around 6 months of age, it can also occur at any time from 3 to 12 months of age. By the age of 3, the baby should have all 20 primary teeth. Teething rings are meant to soothe the gums of a teething baby. As a tooth breaks through the gums, babies may experience itching, discomfort, and throbbing pain. Teething rings provide something which babies can rub or chew against their gums to help alleviate the unpleasant sensation. They also provide some enjoyment to babies who like to hold things in their hands and put them in their mouths. The more texture teethers have, the better it is for babies to play with. There are a lot of teething rings available in the market today. While they are all supposed to be lead-free and non-toxic, how can you be sure that they are actually safe for babies? PVC, plastic, or rubber can contain phthalates or other toxic materials, which can be harmful for the baby. 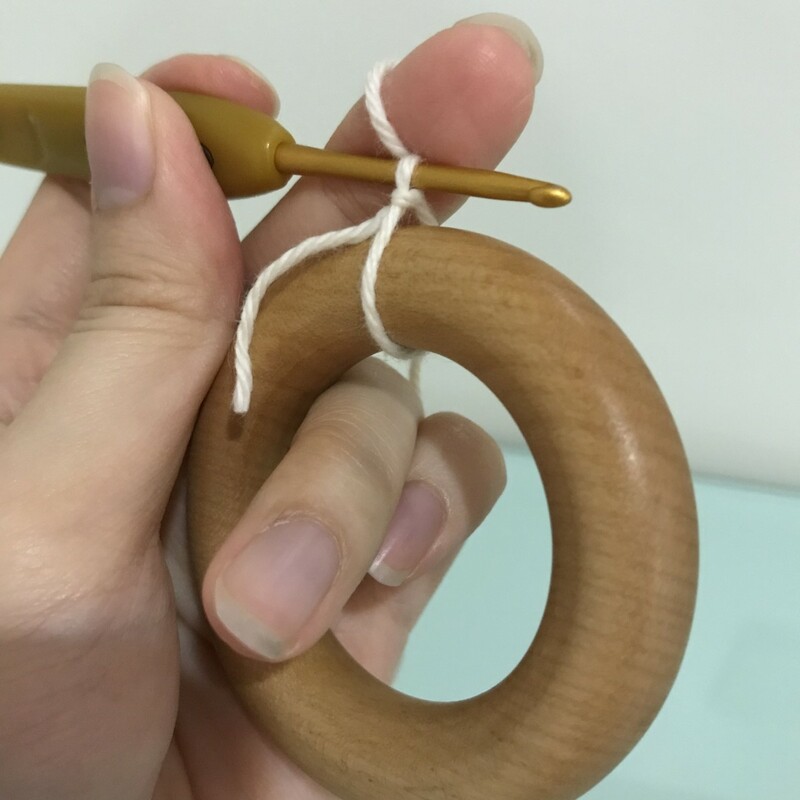 Wooden teething rings are natural, chemical-friendly, and plastic-free products. While there are a ton of different trees available out there, the best type of wood to use for wooden teething rings are hard maple wood. Cherry wood, walnut, madrone, alder, and myrtle woods can also be used. 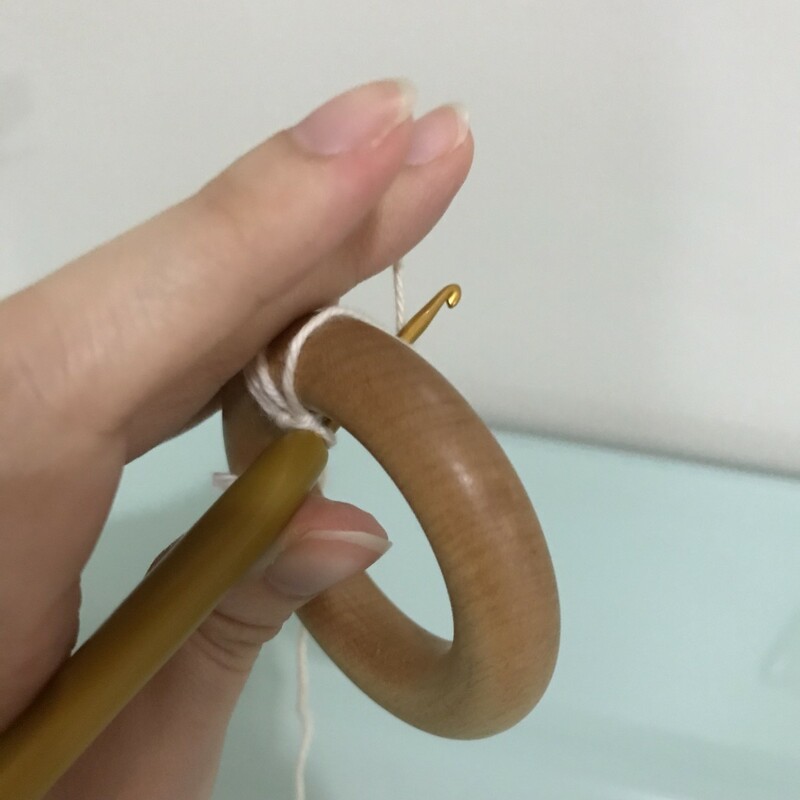 Some wooden rings come with a finish - beeswax and olive oil; or coconut oil - that should help prevent the wood for splintering. 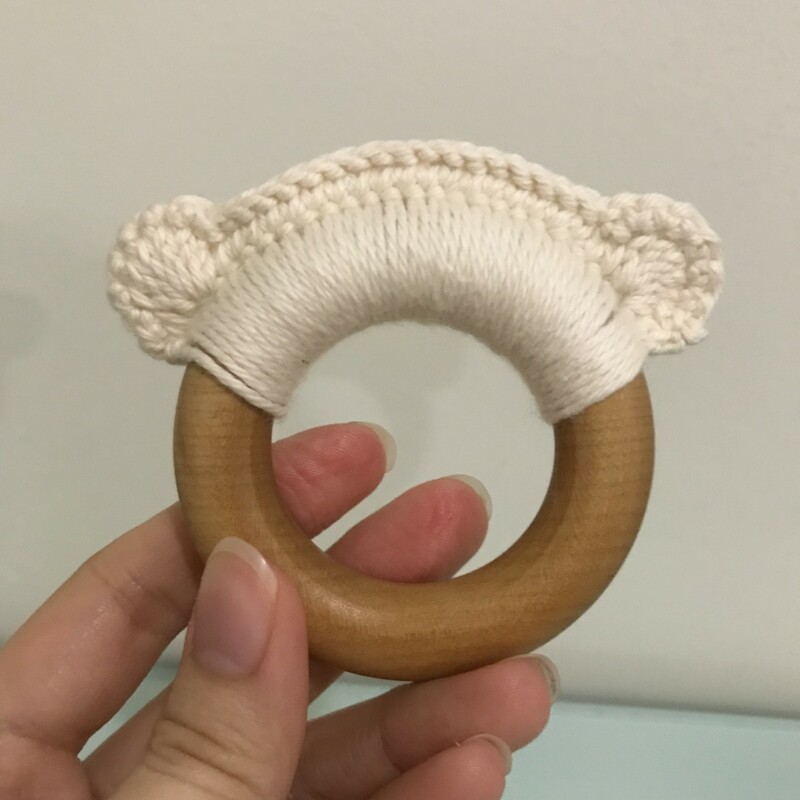 Since we are already going for a natural teether by choosing wood, we also need to realize that there are different types of cotton yarn available. Mercerized cotton is the most popular type, with a huge range from thread to worsted weight. However, mercerized cotton is treated with a sodium hyroxide bath and then neutralized with an acid bath. This treatment is used to increase luster, strength, affinity to dye, resistance to mildew, and affinity to lint. You would notice when browsing for cotton yarns that mercerized ones have a broader color range, which is why it is widely used by different yarn brands. But since we don't actually know just how much chemical residue is left during this process, organic cotton would be the safer choice. If you want to go a step further, there are even Global Organic Textile Standard (GOTS) certified organic cotton yarns. The GOTS is recognized as the world's leading processing standard for textiles made from organic fibers. It defines high-level environmental criteria along the entire organic textiles supply chain and requires compliance with social criteria as well. Blue Sky Fibers is a company that sells GOTS certified yarns. The price is a bit steep, but you get what you pay for. The color choices are amazing, and if you really want to catch the attention of babies, color is definitely the way to go. Working through the ring itself and making sc's with the ring inside each stitch. Before we get started on the tutorial, let me just tell you the pros and cons of each method. The first method limits the amount of ring you can cover, in that, you can't actually cover the whole ring with a single rectangular piece, whereas you can easily cover the whole ring using the second method. 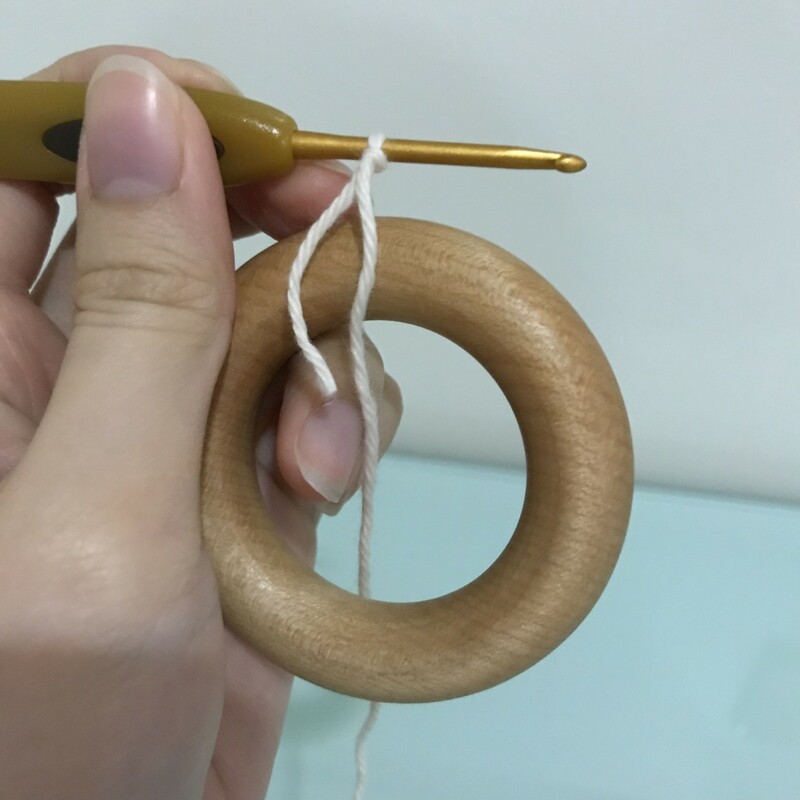 Another thing to take note of is that working through the ring using the second method might result in irregular sized stitches, as it is difficult to make stitches with precise tension each time you go through the ring. If you find yourself getting bothered seeing gaps in your work, it would be better to go with the first method. 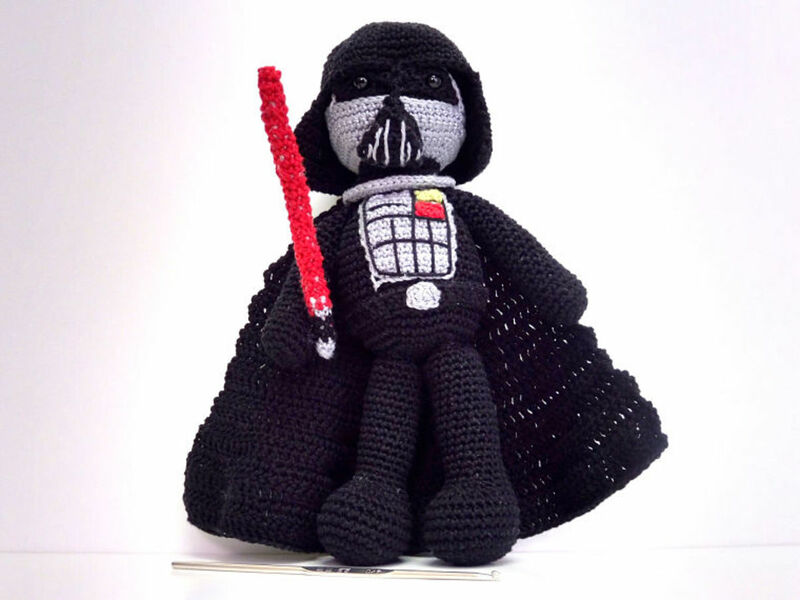 Note: In case you want to know, the bunny ears in the photo are by Anna Wilson from Mommy Made Crochet. 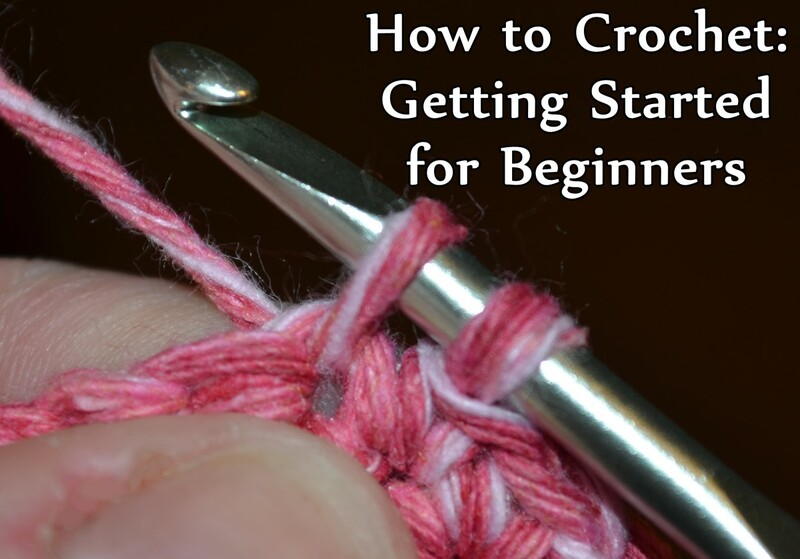 I just used the opposite side of the ring to place my Single Crochet Cover for this tutorial. Step 1: Find the chain length you want for your cover. Make sure it doesn't go over half of the circumference of the ring, as a single rectangular piece will not be able to cover the whole ring. Add 1 ch before working an sc in the 2nd ch from hook and in each ch across, turn. If you're following along, I did a total of 26 chains. Step 2: Ch 1, sc in each ch across, turn. Repeat this step until you can cover the thickness of the ring with the rectangular piece. I did 12 Rows for mine. Fasten off, leaving a long tail for sewing. Step 3: Whip stitch the piece together by matching each stitch on each end. Hide the tails inside the ring to finish the piece. 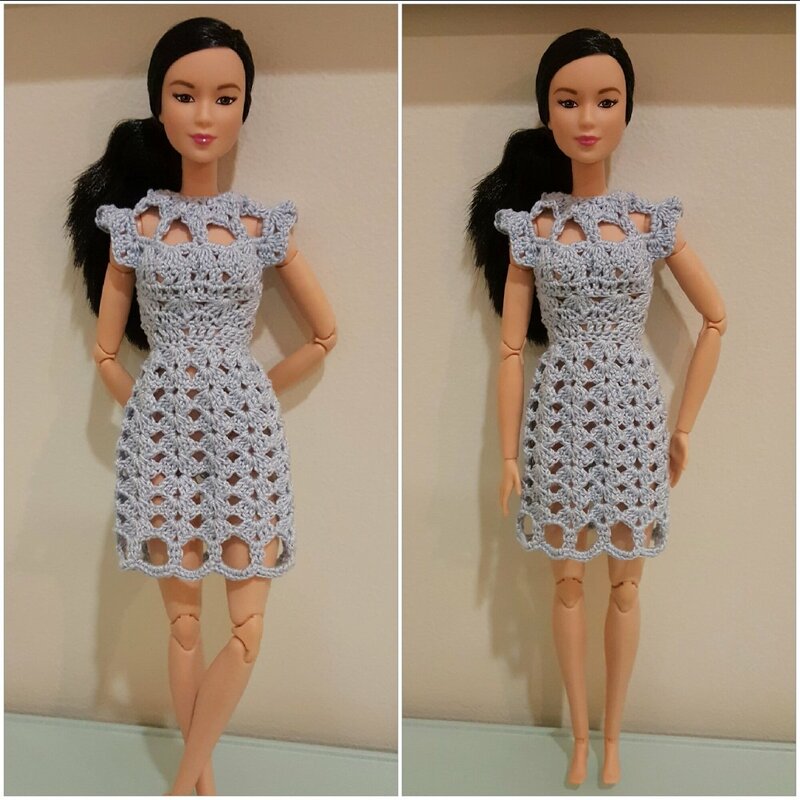 In order to show you the possibilities of different stitch patterns you can make with the first method, here is a written pattern for the Berry Stitch Cover using the berry stitch, which I used in a previous pattern for a berry-stitched shrug for Barbie. Row 1: Ch 25 (should be divisible by 3 + 1), sc in the 2nd ch from hook and in each ch across, turn. Row 2 (RS): Ch 1, sc in the first sc, berry st in the next sc, (sc in the next 2 sc, berry st in the next sc) across, sc in the last sc, turn. Note: Remember to push the berries to the right side of the work while working this row. Rows 4 - 11: Repeat Rows 2 and 3. Fasten off, leaving a long tail for sewing. Whip stitch the piece together by matching each stitch on each end. Hide the tails inside the ring to finish the piece. This part only covers the initial sc's worked through the ring. You will need to learn this in order to make the Bear Teething Ring. 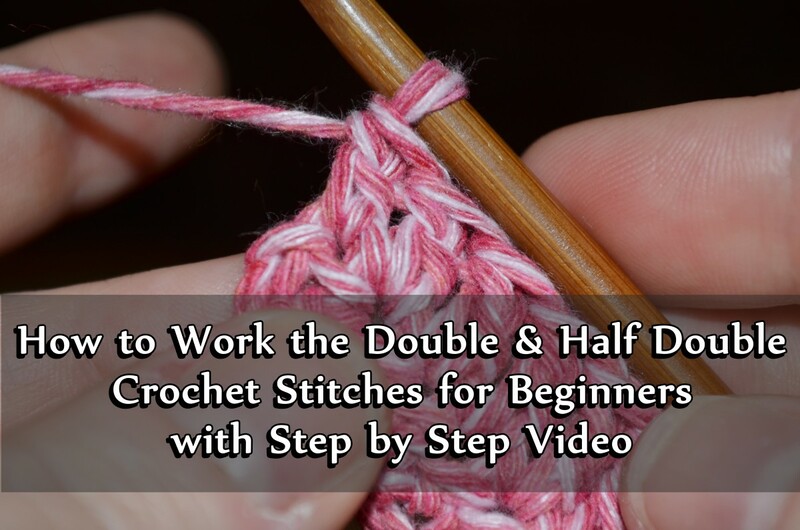 Step 1: Make a slip knot on your hook. 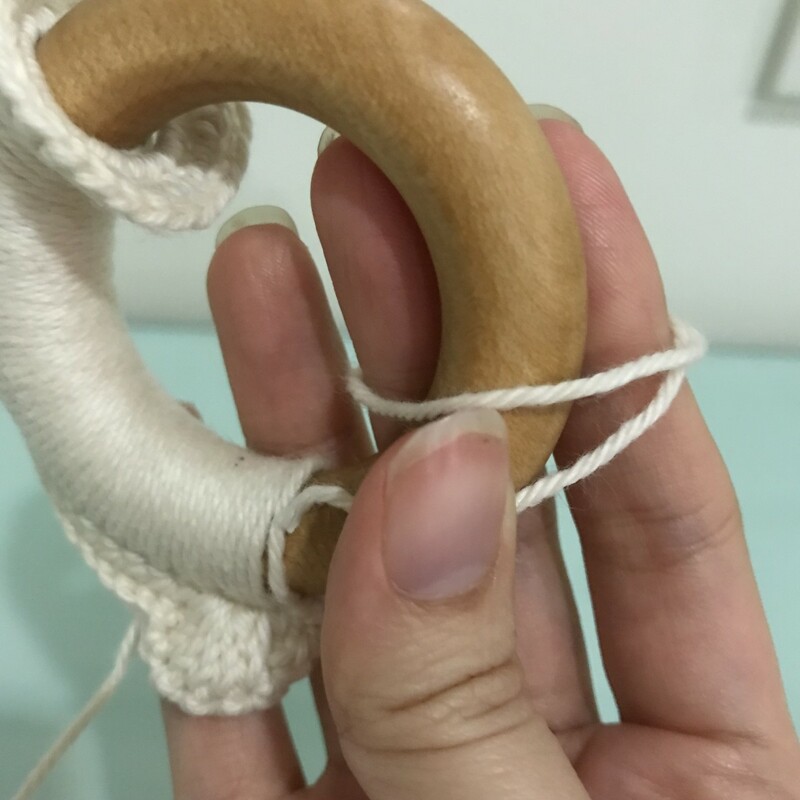 Insert hook through the ring from the back so that the working yarn is at the back of the ring. 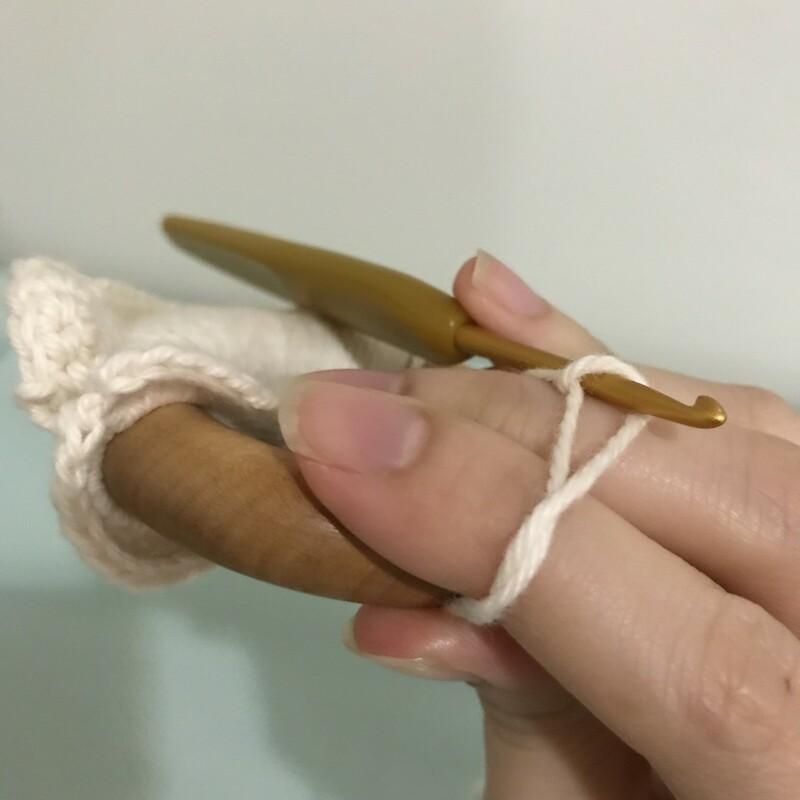 Step 2: Pull the hook above the ring to start working on the stitches. Notice how the yarn is passing through the center of the ring. 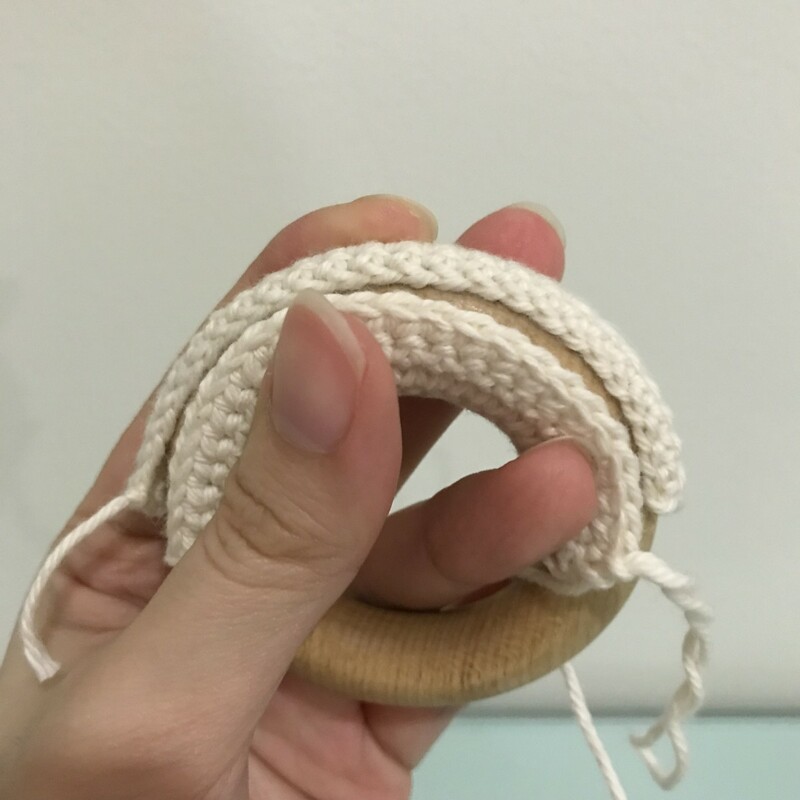 Step 3: Hold the working yarn to the back of the ring, yarn over and pull through the slip knot to make a slip stitch in order to secure the yarn in place. Step 4: Insert hook through the ring again for the next stitch. Yarn over and pull through the ring, lifting up the hook again to do the next stitch, yarn over and pull through the loop to form an sc. Step 5: Repeat Step 4 until you reached the desired coverage on the ring. Fasten off and weave in the ends inside the ring to finish the piece. 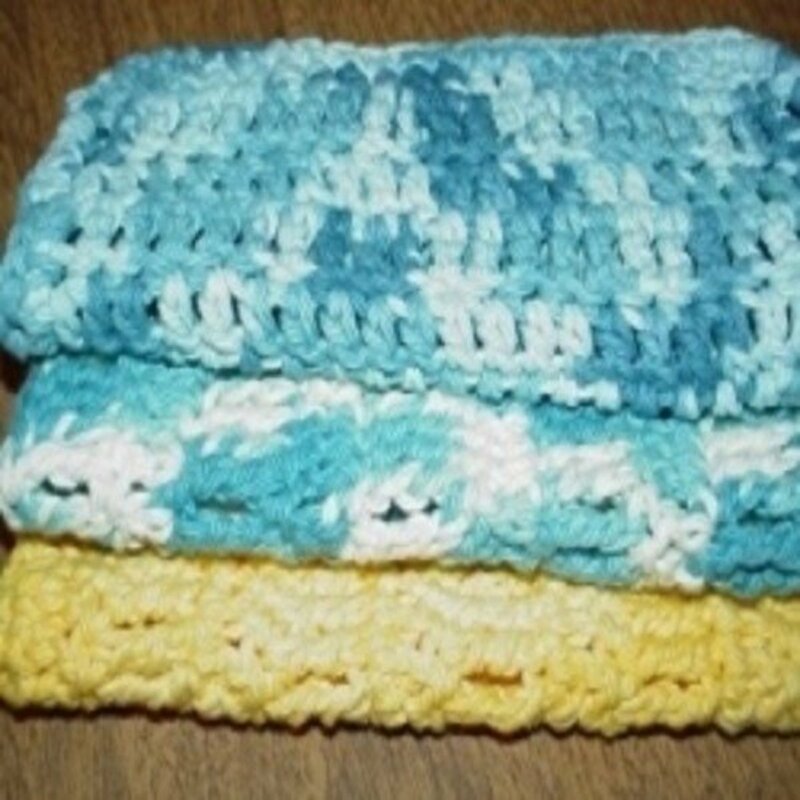 As with the Berry Stitch Cover, I wanted to show you a pattern you can do with the second method. Row 1: Form 26 sc through the wooden ring or however many you want depending on how far apart you want your ears to be. We will need to save 2 sc's on each end so the ear can rest on something at the ends. Do not fasten off, turn. Row 2: Ch 1, sc in the first 2 sc, 6 dc in the next sc, sc in the next 20 sc or until you reach the last 3 sc, 6 dc in the next sc, sc in the last 2 sc, turn. Row 3: Sl st in the first sc, sk 1 sc, sc in the next 6 dc, sk 1 sc, sl st in the next 18 sc, sk 1 sc, sc in the next 6 dc, sk 1 sc, sl st in the last sc. Fasten off and weave in the ends inside the ring to finish the piece. 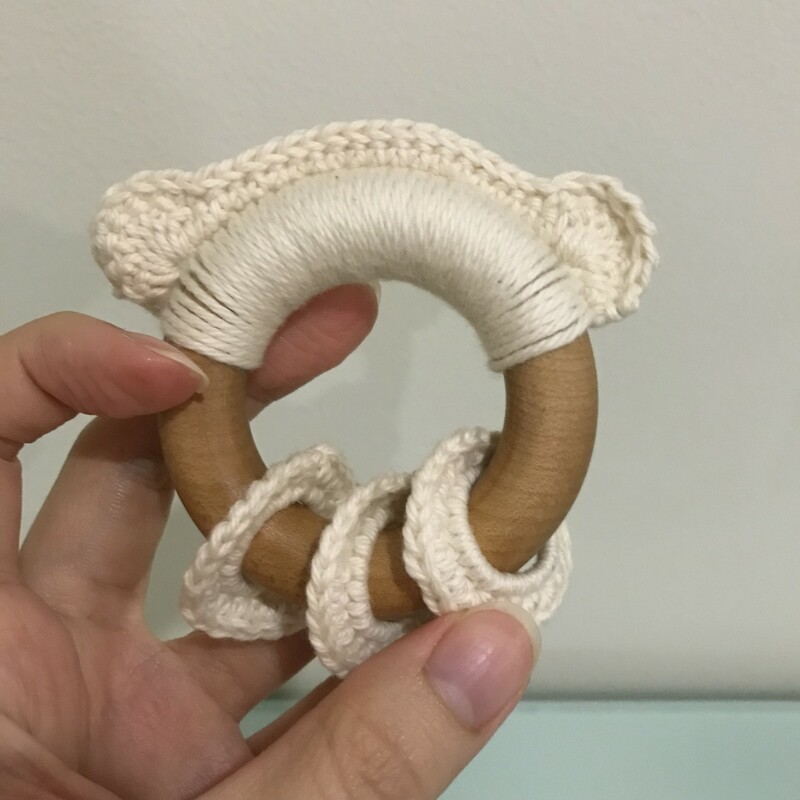 So even after knowing the two methods, you still want to add more elements to your teething ring with your extra yarn. There's also all that empty space you see on your ring. 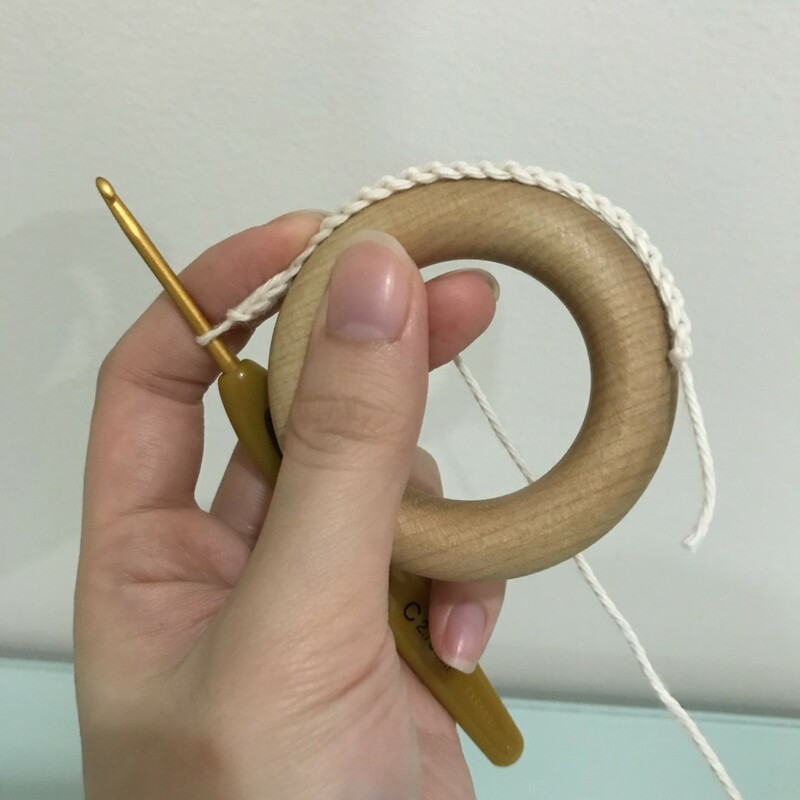 The final thing I want to share with you in this article is how to make Circular Rings. It adds something else for babies to play with and also provides more texture for chewing. 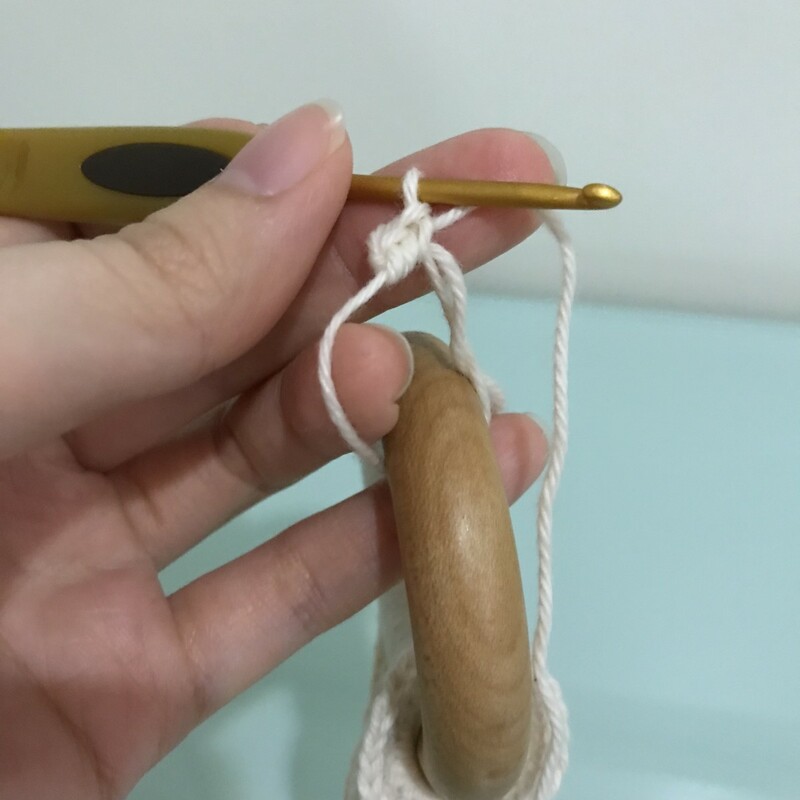 Step 1: Form a magic ring with the wooden ring in the middle. Check the photos below for a step-by-step tutorial. Step 2: Work 20 sc in the magic ring or until you have enough sc to cover the ring and have some space for it to move freely around your teether. Join with sl st in the first sc. Step 3: Ch 1, (2 sc in the next sc, sc in the next 3 sc) across, join. Step 4: Fasten off and weave in all ends. Repeat Steps 1 - 4 to make more rings on the teether. Make sure you face the ring the same way every single time in order to have the RS of the Circular Rings all facing the same direction. 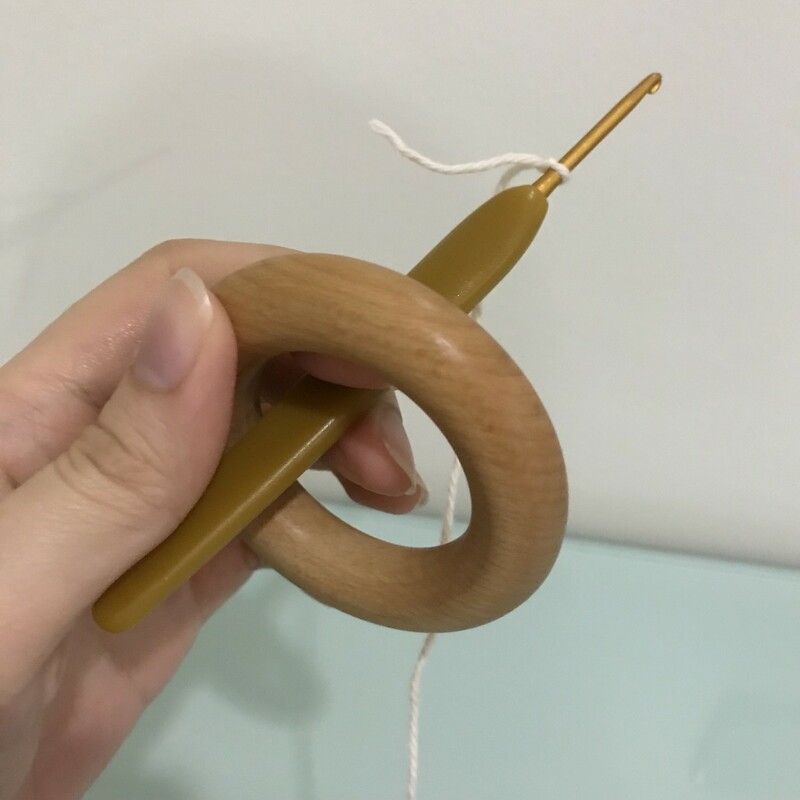 For the first method, you can just use any stitch pattern you want, make a rectangular piece, and sew it on your wooden ring. 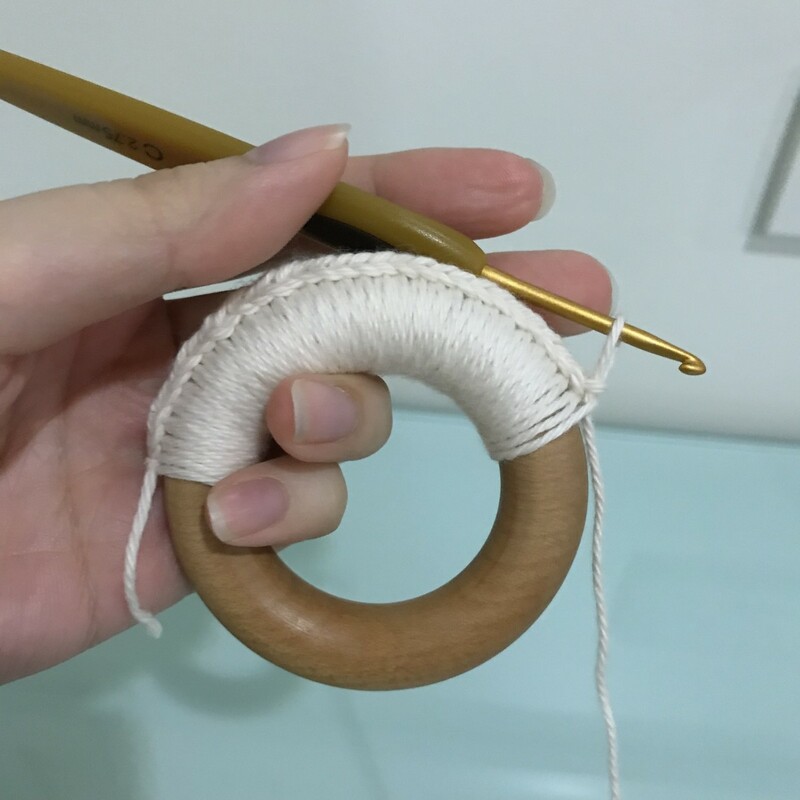 For the second method, you can take any ponytail holder pattern and apply it to the ring for a nice circular design. Add magic circles using the method from the circular ring to form different shapes, like stars and hearts. Add some chains to any method to have hanging elements to your teether. If you want more detailed tutorials on these ideas, let me know in the comments section below. 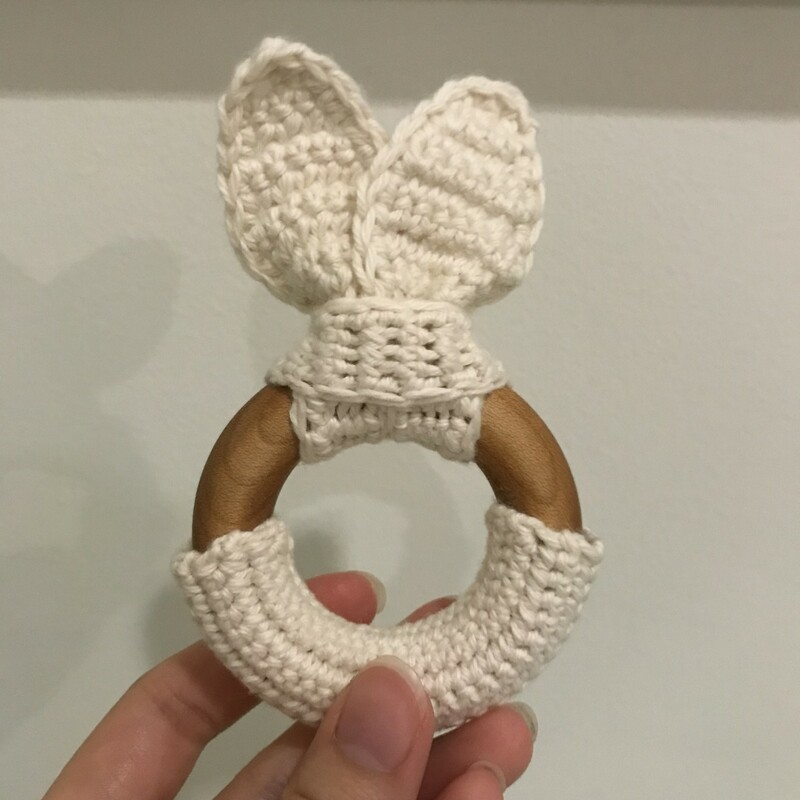 Have fun customizing your baby's wooden teething rings. Great tutorial, and awesome idea. Thanks so much. awesome trick. I loved it.